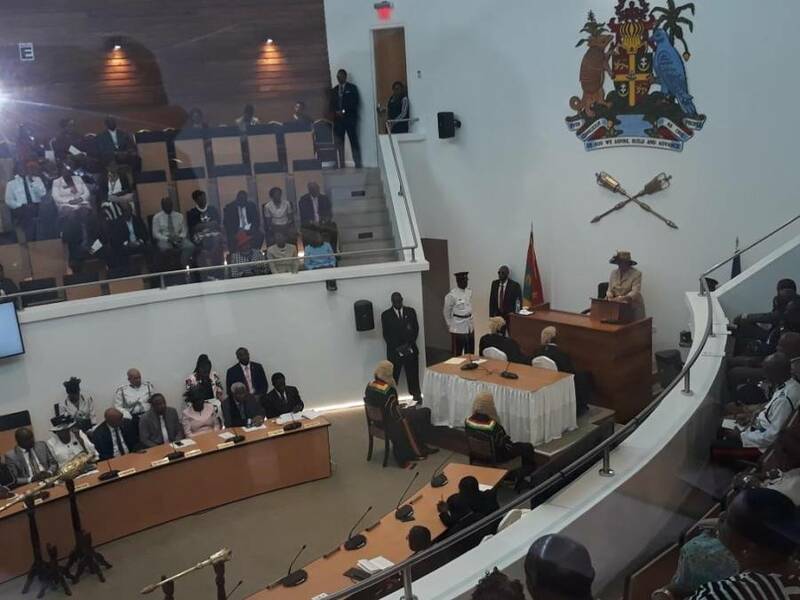 The Governor-General of Grenada, Her Excellency, Dame Dr Cecile La Grenade, and her Government of the New National Party (NNP) led by Dr The Right Honourable Keith C Mitchell, in the Throne Speech of 2018, tend to concretise the position and intent for public officers, with particular reference to their constitutionally-entitled state pensions. On this ‘long-standing and recurring decimal’ social abuse, the Ceremonial state Opening of the Second Session of the Tenth Parliament on 19 November 2018, signals either to continue insulting, disrespecting and fooling public officers, and/or to confirm that public officers are defeated, weaken and vulnerable. The record on the issue also points-out this. Despite the situation or the perception about public sector workers and their trade unions, the Public Workers Union (PWU) in particular, is advised to review its philosophy and approach and to reactivate its arsenal and determination in its thrust for having the ‘full restoration’ of the state pensions, as well as, in its role of giving faithful and strong representation for the members, of protecting the existence and integrity of the public service, and of ensuring ‘vigilance and militancy’ of the labour movement. Review the previously internet-circulated article “Grenada’s Government Pension Proposal Is Absurd”. It has been proven and becoming more and more imperative that public officers ought not to be shortsighted, comfortable and docile on the policy declarations in the Throne Speeches, budget statements, legislative and institutional measures, and in any structural adjustment and sector reform programmes initiated by the government. On the other hand, public officers should always be robustly scrutinising, questioning and challenging the policies and proposals of the government. Public officers over the years have been facing public humiliation and public incitement with political rhetoric and propaganda, as is evident in the misleading “10-Point Fact Sheet on Pension” provided in the 2019 Budget statement by the Prime Minister and Minister of Finance, Dr Mitchell. The quality and resolve of public officers is therefore now at stake, with the industrial impasse on pension benefits as the government seems vowed to continue making the officers the laughing-stock in the Caribbean Community and endorsing the international award of Finance Minister of the Year for the Caribbean, to Grenada from GlobalMarkets (http://www.caribbean360.com/news/grenadas-prime-minister-named-finance-minister-of-the-year#ixzz5XtWr7LWm). Also review the internet article, “New Targets For Pensions To Public Officers In Grenada”, to grasp government’s shifting of the goalpost on the issue. It is prudent and instructive to trace and to reflect the past pronouncements and actions of the NNP’s government about pension benefits for public officers. Keith Mitchell, Lawrence Joseph, Francis Alexis, Chester Humphrey and Oliver Joseph must have been conscious of the conflict which the April 1983 Pensions (Disqualification) Act, PDA, posed with the complete restoring of the Constitution in August 1991; but what has been the sincere position of these high-profile actors since then? Whilst recognising and upholding the constitutional disenfranchisement of public officers to pension-benefits, the government enacted legislation to guarantee gratuities and pensions for parliamentarians in July 1989, Pension (Members of Parliament) Act. The farce and tomfoolery and frustration began earnestly in 1995 when the NNP’s government appointed a Pension Review Committee (PRC), “with a view to the developing of a suitable plan of retirement benefits for public officers”, in response to the efforts of the public sector workers unions to settle the ‘natural, social, moral and legal’ pension entitlements. After various versions of executive committees and consultative studies, with the goodwill collaboration and compromise of the public sector workers unions and the many burdensome constitutional court cases about the applications of the 1983 PDA, the government claims that in 2016 it decides to embark on restoration of pensions and pension reform for public officers. An 18 February 2018 Memorandum Of Understanding (MOU) was signed between the government and the public sector unions and staff associations (Members of the Disciplined Forces of Grenada) under questionable and strange conditions; (https://thenewtoday.gd/local-news/2018/03/01/a-step-closer-to-pension-restoration/#gsc.tab=0) and (https://thenewtoday.gd/local-news/2018/03/08/pwu-agrees-to-sign-pension-restoration-and-reform-mou/#gsc.tab=0). Relying essentially on this MOU, the 1983 PDA and 2012 Judgement of Hermilyn Armstrong vs The Attorney-General and the Minister of Finance, Dr Mitchell contends in his 2019 Budget that the outstanding payment of pension to public officers appointed on or after 4 April 1983 to 22 February 1985 honoured the government’s commitment to pension restoration, and that efforts are now turned towards pension reform for the post-1985 public officers within the current construct and context of the 2015 Fiscal Responsibility Law (FRL). Recall the circulated article “Undefined Pension Reform Touted In Grenada”, which postulates the government’s intention for a universal policy which will affect every citizen, whether in the public or private sector. Dr Cecile La Grenade holds that the government remains firmly committed to pension reform. She promotes that to meet this commitment a Pension Secretariat has been established and “the services of a company to conduct an actuarial study to assist in designing an appropriate package based on Grenada’s particular financial situation” has been secured; and that it must be ensured that decisions taken on this commitment are done within the parameters of the 2015 FRL. How does the Governor-General’s statement reveal the performance of the 1995 PRC? How does it relate to what contains in the 2008 Budget statement, “Government awaits the findings of the Actuary and Pension Planner from the firm of Bacon Woodrow and De Souza out of Trinidad who has been retained to examine the implications of various pension schemes, recommend an appropriate one for Grenada and suggest proposals for its financing. … the report of the Pension Planner should be completed by next year February (‘2009’)”? Moreover; how does the statement concur with pertinent declarations in her 2017 Throne Speech; Pension Secretariat has been established, Data Base on eligible public workers for pension has been developed, and Cost Estimates and the mechanics for payments are being analysed? Strikingly are the repeated parallels on the attitude of the government towards court judgements on the constitutional pension-benefits to public officers. Thus for example; as reported in the Editorial of The New Today newspaper of Friday, 23 November 2018, immediately after the case between Irvin McQueen and The Public Service Commission, Civil Appeal No. 17 of 1997, (http://www.worldcourts.com/ecsc/eng/decisions/1998.09.15_McQueen_v_PSC.pdf), Prime Minister Mitchell set-up a committee to address the pension issue. Similarly; following Hermilyn Armstrong’s case (http://www.worldcourts.com/ecsc/eng/decisions/2012.10.15_Armstrong_v_Attorney General_of_Grenada.pdf), the pension secretariat and a Government Pension Engagement Committee have been established to negotiate pensions for public officers, as Mitchell insists that those appointed after 22 February 1985 are not legally entitled to a pension from Government but only from the National Insurance Scheme. Have public sector workers and their trade unions found themselves in an entangled web, or in a vicious circle of deceits? What is it that public officers now have to gamble to affirm rights, role, responsibility and respect? Are public officers really boxed-in by NNP’s government?